Where Did the “5 Steps” Come From? Scott’s list was narrowed down to five, so the five fingers of the hand could be used to teach people the gospel. This simple mnemonic device eventually evolved into the five steps with which many of us are familiar today. 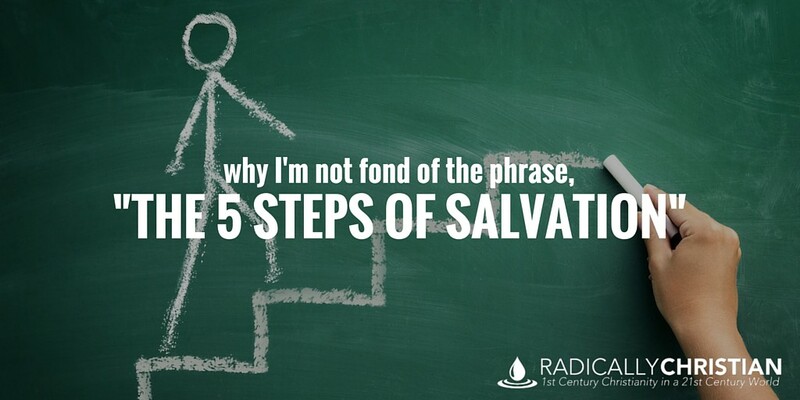 So we need to realize that the “5 steps,” as an upward staircase to salvation, is an illustration people came up with as a shortcut to teaching people the gospel. Unfortunately, this teaching method sometimes gives people the impression that God provided a checklist for mankind to save himself from sin. But this is NOT the gospel message and the church has been trying to deal with this unfortunate misunderstanding for quite sometime. Some have been wont to show that there is a human side and a divine side to salvation, and in doing so they have made the human coordinate with the divine. Worse, in the minds of some the divine has been completely ruled out and salvation made a matter of human achievement — except that the “plan” was divinely given. The gospel was made a system of divine laws for human beings to obey and thus save themselves sans grace, sans mercy, sans everything spiritual and divine — except that the “plan” was in mercy given! God provided a Savior – not a checklist – to save mankind from sin. And God did not provide a staircase for man to ascend; He provided a Savior, who descended to earth to lift mankind up. This certainly does not mean there is nothing for us to obey, and it doesn’t mean there isn’t a scriptural pattern for us to follow, but it does mean if we give people the impression that we save ourselves by ascending a staircase, then I’m afraid our gospel shortcut has unintentionally perverted the gospel. One of my problems with illustrating obedience to the gospel with five ascending steps is that we give people the impression that each “step” is a one-time act. After all, when you climb a staircase, you only stand on each step once. Likewise, repentance is ongoing. Certainly we must “die to sin” in order to be buried with Christ in baptism (Romans 6), but to illustrate it as a step on a staircase is to imply that we can finish repenting. But in order to be a Christian, you must live a repentant life (see 1 John 1:7-2:2). And finally, confessing of our faith in Jesus Christ is also an ongoing part of Christian living. Yes, it is good and biblical to make confession at our baptism, but that cannot be our only confession of Christ. When Jesus said, “Everyone who acknowledges me before men, I also will acknowledge before my Father who is in heaven” (Matthew 10:32), He was not talking about a one-time confession in front of other believers at baptism; He was talking about an acknowledgement before unbelievers that could get you killed (see Matthew 10:34-39). Baptism is the only thing on the list that is truly a “step” in the sense that it is a one-time act. But when we talk about belief, repentance, and confession as “steps,” I’m afraid we leave people feeling like they accomplished these things and they are done with them. When the reality is, obedience to the gospel is believing, repenting and confessing Jesus as Lord on a daily basis. The truth is so simple: man has sinned; and though we deserve death, God has graciously paid the penalty for our sin. You can’t earn or merit salvation; you can only receive it by faith (Ephesians 2:1-10). Receiving salvation by faith includes believing in Jesus Christ, it includes trusting in Him (not sure why “trust” never gets listed), it includes repentance, it includes confession, it includes baptism for the forgiveness of sins, and it includes walking faithfully with Jesus in newness of life. We begin receiving God’s saving grace at baptism, and then we continue receiving God’s saving grace as we walk with Him in faith. Salvation is NEVER presented in Scripture as a staircase God gave us to climb. That is a man-made illustration. And presenting the gospel this way, I believe, gives some people the wrong understanding. My baptism was not me reaching the top of a staircase; it was me – in response to the Good News – desperately throwing myself at the feet of a gracious God, appealing to Him for salvation and a good conscience (1 Peter 3:21). My confidence comes not from my having accomplished five tasks on a list, but from what Jesus accomplished on the cross (John 19:30). My confidence comes from knowing the Lord is “faithful and just to forgive us our sins and to cleanse us from all unrighteousness” (1 John 1:9). This is certainly not meant to be an indictment of, or an attack upon, those who use this teaching method. I just want to make a plea for us to prayerfully and studiously consider how we choose to illustrate and teach people the gospel.